Always liked this engine. Ill be following along as well! I didn't get what draws me to the Stuart engines...but your descriptions give part of the reason Jo. The other part I think is the green paint, dunno why but it makes them look purposeful. So to the castings. By looks of the machining marks these have been started by someone who only had use of a lathe, there are a couple of bits missing which I have found suitable replacements in the orphaned castings box. The outstanding bits of note are the piston which can come out of a piece of 2" CI bar and the crankshaft which will be assembled. Centres have been put in the rods, the standard might be slightly short (which can be taken up on the sole plate), the connecting rod has been started but lots of metal is still there The only bit that I question is the big end caps which have had their two sides turned leaving only 13.3mm rather than the 14.3mm width it should be. Great to see this Jo. Lots of nice details on the design as well and I do like that valve rod support which your earlier set has from the looks of it. Will be following along also. 2, Piston rod length - 25.4mm thread on end /16mm thread = thread for the nut to fit on split pistons. 4, Studs on standard - 5BA /4BA. 5, Crankshaft diameter through flywheel - 12.7mm / 11.1mm, the earlier engine is keyed the later has grub screw. 6, Eccentric arm - one 4BA mounting screw/two 5BA mounting screws. 7, Earlier drawings have no allowance for cylinder lagging. I wil be following along I have two sets of castings for a similar engine and it is about time i finished them. Are you going to actually finish this one? I think I am happy with the box bed and that can go for painting, while I think about the soleplate and give Eric a for some pics. I myself would shy away from something someone else started, had some problems, and then walked away. Looks like you have a plan for resurrecting what was done. These engines are fascinating, I have a friend who built several. I'll be stopping bg by now and again to see your progress. Eric has been encouraged to provide photo's of his build. He has been zooming ahead and is currently trying to set up to cut the 8 degree angle on his soleplate. Just a pedantic quibble, Mr Stuart Turner started his business at the end of the 19th Century, not the 18th Century. The earliest catalogue I have is 1906, which features the No. 1, No.2 (a high speed short stroke version of the No.1), No. 3 compound, No. 4, No. 5, No. 6 compound, No. 7, No. 8 and No.9. A At this date, the No. 4 and No.7 had single standards like the No. 1, the trunk guides not being introduced until the 1930s. A casting set for the No.1 was 20/- 'packed in a strong box' and reversing gear was available for an additional 6/6. A valve rod support casting is listed, though it isn't apparent in the illustration. A disc flywheel was available in place of the usual spoked flywheel. At some point in the 1920s, the No. 2 was dropped from the list, as it doesn't appear in the 1931 catalogue. 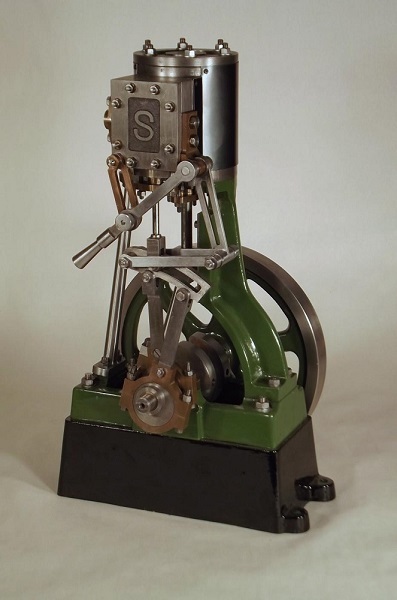 If you've got 2 sets of No.1 castings, why not build a No.2, as far as I can see, all it needs is the thicker piston and a reduced stroke crank, with a balanced disc flywheel? Off to a good Start Jo. For anyone who wants to read a bit more about the design evolution of some of the Stuart Engines this site is a good read. The No2 complete with generator would make a handsome display. I think a hollow piston would be in order if making a No2 or risk it jumping off the bench, I seem to recall the No1 book shows that option. Bad Behavior has blocked 16502 access attempts in the last 7 days.